Which drive mode do you prefer the most? View Poll Results: Which Drive Mode do you prefer the most? Thread: Which drive mode do you prefer the most? You can't run two chips. One chip runs the engine. There's another thread with a video on the 90 second installation. Yes, it just unclip the harness and take it out to go to the dealer. So no warranty void or anything? Nothing where they can tell I've been using it? Im too poor to have gotten the gt :( need to do more research on this chip but can it be used in the 2.0T? Two seconds of research I answered my own question. Has anyone used it on the 2.0? Only on the 3.3t so far. Smart mode allows you to customize the various parameters available such as shifting, ride stiffness, steering sensitivity into a combination of your choice. 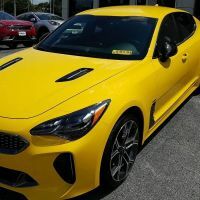 Which Kia Stinger Engine Cover do you prefer? Kia Stinger Concept vs Production, which design do you prefer?